While commentators argue about who or what is most at fault for South Sudan’s return to conflict, one thing is clear: the international community is not free from blame. 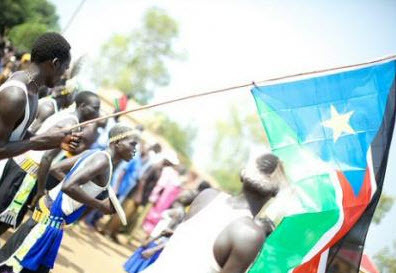 The South Sudanese flag flies at independence in 2011. Photograph by Arsenie Coseac. What has gone wrong in South Sudan? As the country today marks the ninth anniversary of the signing of the Comprehensive Peace Agreement (CPA), which ended decades of conflict between southern insurgents and the government of Sudan and paved the way to independence, South Sudan is experiencing another wave of violence and conflict – this time within its own borders. Over the last few weeks we have seen what was ostensibly a political tussle for power in the world’s newest country descend into shocking violence, leaving over a thousand people dead and around 200,000 displaced. While commentators can argue about who or what is most at fault in this terrible turn of events, one fact is clear: the international community – the many regional and international players who have been supporting the transition in South Sudan − shoulders some of the responsibility. Contrary to narratives of progress that ignored the complexity of the country, the real picture has been far from rosy in the nine years since the signing of the CPA in 2005, and in the three years since the 2011 referendum that ushered in independence for South Sudan. Indeed, the political wrangling that has gripped the ruling party, the Sudan People’s Liberation Movement (SPLM), over the last few months, and the ferocious violence unleashed on the nation’s capital and much of the country over the last three weeks, did not come as a complete surprise to those who know South Sudan. Over the last few years, South Sudan has served as a testing ground for international engagement in so-called ‘fragile states’, an engagement which has too often followed textbook prescriptions and overlooked the political and social realities of the country, treating it instead as a technical exercise in state building. Many in the aid sector in South Sudan have been operating on the assumption that greater development – improved services, infrastructure, access to food – would lead to stability and lasting peace. These assumptions were fundamentally challenged in Aiding the peace: a multi-donor evaluation of support to conflict prevention and peacebuilding activities in Southern Sudan 2005-2010 which found no evidence of the assumed causal link between the provision of basic services (‘peace dividends’) and a reduction in conflict. As stressed already in 2009, transitioning from war to peace is not a technical exercise but a highly political process. South Sudan was born amidst ongoing political power plays, deep divisions and conflict at many levels − issues that remain unresolved. The international community – and particularly donor governments – had high expectations for peace in South Sudan after the signing of the CPA. Seeing the conflict between the North and South as the main threat to peace, many overlooked the deeply entrenched divisions within the South that would continue to shape relationships and the political leadership after independence in 2011. Longstanding and unaddressed grievances deeply rooted in South Sudan’s turbulent history were left unhealed and have now come to the surface again. The inherently political battle for power and control of the ruling party has increasingly taken on strong ethnic connotations. In South Sudan, ethnicity is often manipulated to create enmity between groups (tribes, clans or sub-clans) for political or military advantage. The biggest problem is that the violence has created a cycle of revenge and fear, tinged with ethnic divisions,which will be extremely damaging for the future cohesion of the country. The longer the violence continues, the more difficult it will be to stop the country from sliding into all-out civil war. The immediate focus now is on stemming the violence. While President Salva Kiir and former Vice-President Riek Machar have reportedly committed to dialogue, no real progress has been made, and once again peace talks were stalled on the issue of political prisoners yesterday. That deadlock does not seem to have been broken today. On the anniversary of South Sudan’s independence referendum, Kiir and Machar must take responsibility for stopping the fighting, call for restraint and commit to holding direct talks urgently. The country cannot afford to wait for a long drawn-out political peace process. Stopping the violence immediately is the priority, alongside a serious process of reconciliation in the long-term. While the people and politicians of South Sudan will undoubtedly be the most significant players in determining the future of their nation, international actors will also need to reflect on how to refocus their efforts to support a peaceful transition in South Sudan. These will need to build on a sophisticated and nuanced analysis of power relations, causes of vulnerability and drivers of conflict, which must be continuously revised to be useful. Technical fixes have failed South Sudan: it’s time to put politics at the heart of the nation-building project at last.